Once upon a time, a traveling circus came to Atlanta. The troupe ran out of money and could not afford to keep going. A wealthy landowner offered to buy the train cars containing the circus animals, but he only wanted the cars for scrap metal. The creatures were a package deal and stayed put in the city. Officials said Grant Park was the best place to house all the animals; thus, Zoo Atlanta was born. Fast forward 123 years to our present time. Zoo Atlanta is excited to offer a new opportunity for kids both young and old to experience the wildlife up close and personal. Twiga Terrace is now open at the giraffe exhibit. A beautiful deck allows guests to look the tallest mammals on Earth straight in the face. 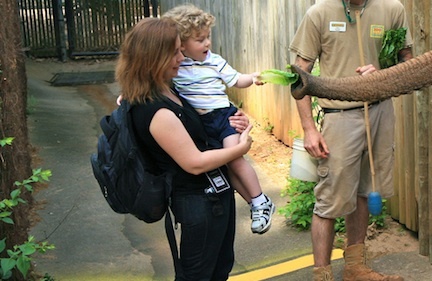 Plus visitors have the chance to feed the giraffes lettuce, a regular part of their diet. It’s only a $3 donation to access Twiga Terrace although the feeding times are scheduled and on a first-come-first-serve basis. In addition to Twiga Terrca, there are new behind-the-scenes tours appropriately named Wild Encounters. Imagine feeding a Komodo dragon using giant tweezers (we did y’all and it was so cool!) These will take place on Fridays, Saturdays and Sundays at 12:30 p.m., $35 per guest. African elephant Wild Encounters will run daily at 1:30 p.m., $75 per guest. Giant panda Wild Encounters will run daily at 11 a.m., $150 per guest. All-inclusive programs for all three species will run Fridays, Saturdays and Sundays at 11 a.m., $185 per guest. Children under 3 are free, but are not permitted to feed the animals. Children ages 3-8 will be allowed to feed the animals with adult assistance. Pretty Southern was lucky enough to be invited on a Wild Encounter. We met Tara & Kelly, the Zoo’s pair of elephants. These elephants are smart. They can learn commands, comprehend games, and have powerful memories (remember an elephant never forgets?) Both gals are twenty-somethings who like to have fun with both their keepers and visitors at Zoo Atlanta. Kelly was in a great mood during Wild Encounter. For more information, check out Zoo Atlanta’s website. Prices and hours are available (y’all it’s not expensive at all for an amazing experience!) 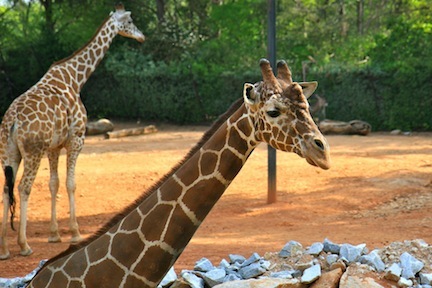 Zoo Atlanta’s mission is to return as much of the revenue it takes in back to conservation. 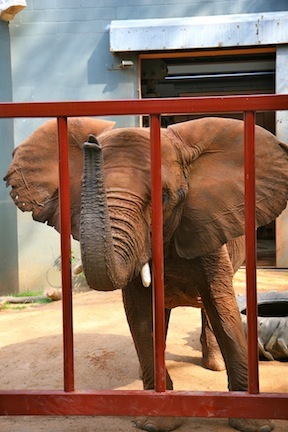 Due to deforestation, human expansion to find farmland in developing nations, and destroying a food chain supply many of the animals at Zoo Atlanta are either endangered or “vulnerable”. It’s important for us to do our part here in the South by visiting the Zoo to help support the animal kingdom around the world. There’s also the Wild on the Rocks event series coming up this summer. Ticket prices include two complimentary cocktails, light hors d’oeuvres, exhibit tour and a lesson on love in the animal kingdom. The next Wild on the Rocks (“Flirting with the Future”) is Thursday, April 26, 6 p.m. to 8:30 p.m. Zoo Atlanta is plugged in with all you wild things out there. Like them on Facebook, follow on Twitter, and check out more photos here on Pretty Southern. Love this! We so enjoyed having ya’ll at the zoo!